Is there a special race run/walk coming up for you and your charity team? 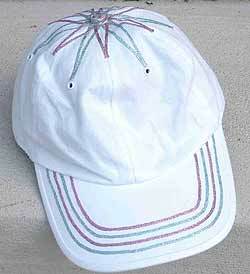 Create your own team apparel by decorating blank baseball caps with iron-on thread. You can add initials, symbols, or motifs like a pink ribbon (for breast cancer awareness). This project is also fun and easy for any group field trip, family reunion, camp, or after school class. Make sure the hat is clean and dry before beginning. Turn your iron onto the highest heat setting and allow it to heat thoroughly. If you need design lines to follow, use a disappearing pen or pencil to trace from a stencil or draw freeform. Lay your iron-on thread at a starting point, cover with the Teflon Press Cloth, and tack down with your iron. Continue along your traced lines, laying the thread directly on top of the marks, pressing the thread in sections, ironing for 3 to 5 seconds to make sure the thread adheres. When finished, clip the thread and begin with another color in your next area. Tip: Wearables get a lot of, well, wear, so if the thread starts to pop off, simply re-press with a hot iron.